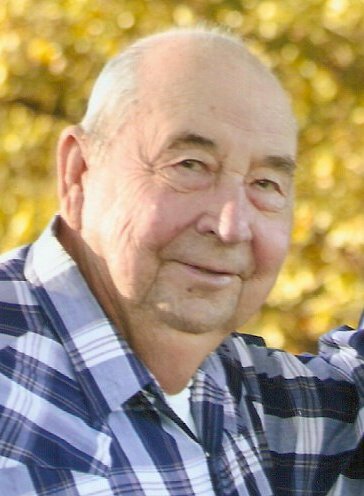 Obituary for Roy Adolph Pohlman | McCombs Funeral Home Inc.
Roy Adolph Pohlman, 81, of Perryville passed away Friday, September 7, 2018 at Independence Care Center in Perryville. He was born June 15, 1937, in Apple Creek, a son of Christian and Meta Zoellner Pohlman. He and Audrey Hobeck were married December 7, 1956. Roy was a lifelong member of Trinity Lutheran in Friedheim, where he served on numerous boards and served as an elder. He owned and operated Pohlman Trucking in addition to his dedication as lifelong farmer in the Perry County area. Roy was a charter member of Sons of the American Legion Post 133 where he served diligently as Chaplain. He was also an American Legion Booster Member. Roy’s presence of his family by his side at the time of his death was a testimony of how he lived his life and the importance of the role he played in his family. He was loved and respected by not only his family, but everyone he met. His grandchildren were his pride and joy. After his retirement he was able to return to one of his favorite childhood joys “fishing”. He and Audrey loved to travel and together enjoyed the opportunity of seeing many parts of the world. Survivors include his loving wife of 61 years, five sons, Roger (the late Sindy) Pohlman of Frohna, Don Pohlman of Jackson, Paul (Jane) Pohlman of Perryville, Steven (Jolene) Pohlman and Roy (Dana) Pohlman both of Apple Creek, and a sister, Viola Ruesler of Friedheim. Also surviving are Roy’s pride and joy, his twelve grandchildren, Jason, Christina, Samantha, Blake, Mia, Luke, Phoebe, Jake, and Kirsti Pohlman, Daphne Bohnert, Whitney Hemman, and Kaitlyn Wills, nine great grandchildren, Stuart, Andrew, Nick, Wilbert, Shyleigh, and Tatum Pohlman, Libby Hemman, and Lane and Owen Bohnert, and one great great granddaughter, Ellie Pohlman. He was preceded in death by a brother, Milton Pohlman, a daughter-in-law, Sindy Pohlman, and a brother-in-law, Marvin “Shorty” Ruesler. The visitation will be from 3:00 pm to 8:00 pm on Tuesday, September 11, 2018 in Chapel A at McCombs Funeral Home and Cremation Center in Jackson and from 9:30 am until service time on Wednesday, September 12, 2018 at Trinity Lutheran Church in Friedheim. The funeral service will be at 10:30 am on Wednesday, September 12, 2018 at the church, with the Rev. Roger Steinbrueck officiating. Interment will follow the service at New Salem Cemetery near Daisy. Serving as pall bears are Jake, Luke, Jason, Blake Pohlman, Matthew Wills, and Kevin Kaempfe. The family suggests that contributions be made to Trinity Lutheran Church in Friedheim, Crown Hospice, Saxony Lutheran High School, or Donors Charity of Choice.